Geraldine “Jerrie” Mock — the first woman to fly solo around the world — has died at the age of 88, some 50 years after her history making journey, which included a stop in Bermuda. 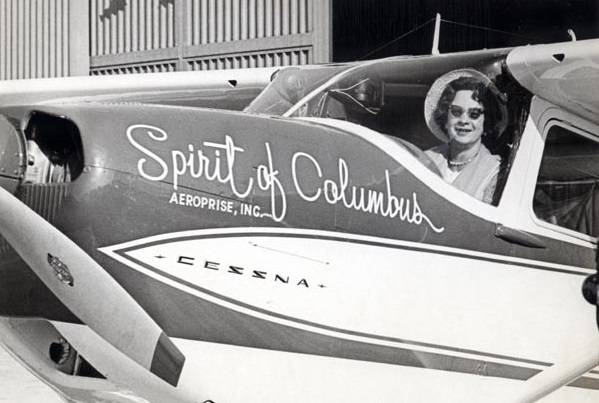 Mrs. Mock flew a single engine Cessna 180 christened the Spirit of Columbus, which was affectionately dubbed “Charlie,” and jointly owned by Mrs. Mock, her husband and a friend. Beginning on March 19, 1964 in Columbus, Ohio, and ending April 17, 1964, also in Columbus, the 23,103 mile journey took the pioneering aviator 29 days, 11 hours, and 59 minutes to complete. She began flying lessons in 1956 and earned her private pilot certificate in 1958. She attended Ohio State University, ranking as the only woman then enrolled in its aeronautical engineering program; in 1961, Mrs. Mock became the first woman licensed by Ohio to manage an airport. By 1962, she had accumulated over 700 flight hours, though she still had no over-water experience. Mrs. Mock took him at his word, and began to organise her flight in earnest, with her interest piqued after she discovered that only men had flown around the world and that there were no such records made by women. The mother of three took off on March 19, 1964 from Columbus, Ohio, with the Kindley Air Base in Bermuda the first stop on her journey around the world. After leaving Bermuda, Mrs. Mock then stopped in the Azores, Morocco, Algeria, Libya, Egypt, Saudi Arabia, Pakistan, India, Thailand, Philippines, Guam, Hawaii, California, Arizona, and Texas before making her way back to Ohio. The trip was not without its perils, as she flew through poor weather and suffered brake failure and radio transmission problems, but the ambitious pilot managed to return home unscathed with her record set. Mrs. Mock also set a number of other flight records, such as being the first woman to fly across both the Atlantic and Pacific Oceans, and becoming the first woman to land a plane in Saudi Arabia. Among her honours, President L.B. Johnson awarded Mrs. Mock the Federal Aviation Agency Gold Medal for Distinguished Service Award. Speaking some 50 years after her record breaking journey, Mrs. Mock told AirSpace Mag, “I didn’t think it was such a great thing; it was just lots of fun. It was a good, practical thing that dozens of women, both in the United States and other countries, could have done before I did. “You just use your common sense, know how to fly the airplane, do what you’re supposed to do, know the routes and all the rules and regulations. Mrs. Mock was predeceased by two sons, and is survived by a daughter, 12 grandchildren and 13 great-grandchildren. She and Russell Mock divorced in the late 1970s, and he died in 1991. What a wonderful trailblazer! Rest in peace Mrs Mock.